We all likely fall into one of two camps: Those who barely need an invitation to wear their PJs outside the house and those totally horrified by the thought of it. To those in the latter group, we see your hesitation but fear you’re missing out. The pajama dressing trend has been prominent for a few years now, and seeing as so many women currently favor the comfort of sneakers over stilettos or track pants over trousers, it comes as no surprise. Indulging in a silky set or cozy robe at home is a highly encouraged upgrade for any lazy weekend, but there's no reason a Saturday night couldn't benefit as much from a pretty nightgown as a Sunday afternoon can. So ahead, we've provided options for all. Whether you're only ready to dabble in wearing PJ tops with jeans or are fully prepared to commit to a feather-details suit set, shop all the pajamas you can—and should—wear in public. 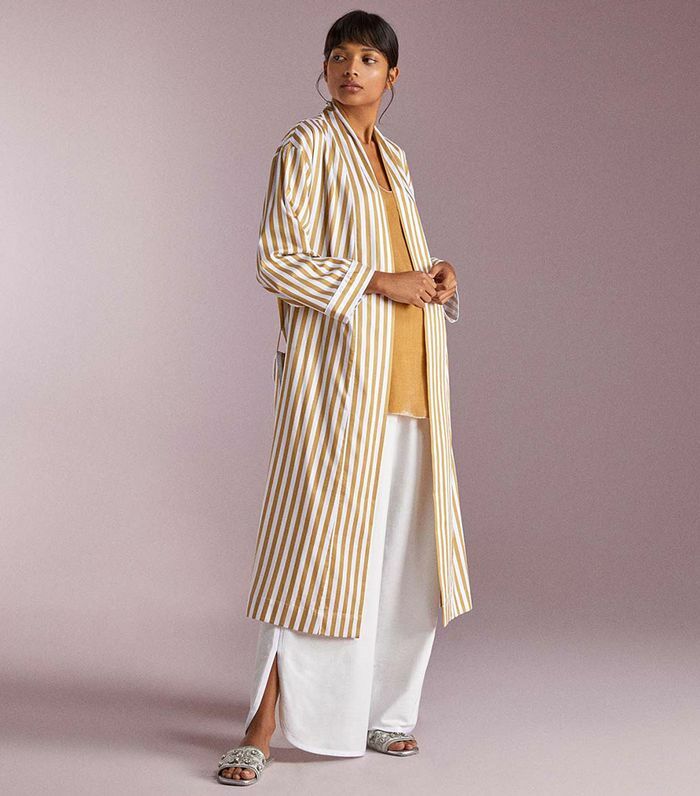 Swap your usual overcoat for a striped, relaxed-fit robe. Think of this as a classic oxford shirt, but much one you can slip right into bed with. Party PJs, if you will. Available in sies XS to XL. Yes, a going-out slip dress and a slip nightgown do look awfully similar. Skip the tailored suit in favor of something that's a bit more relaxed in fit. We love the choice of a bold, bright color. Meet your go-to jeans' new best friend. The trick to making this daytime-ready? Just a few accessories. For extra styling options, tie the shirt up or wear it open as a light jacket. A punchy pattern is never a bad idea. A striped shirt to wear with pretty much anything at all. Now these are party pants. Pair with heels or slippers—your call. A velvet fabric makes this effortless set feel even more luxe. If you're still hesitant, just start by swapping in a pajama top for your usual T-shirts. Consider yourself all set to wear pajamas in public, or at the very least, the trend is a big push to finally upgrade your PJ drawer.